Originating during the 19th century, the Border Collie was so named due to their home of development on the border of Scotland England. This breed was prized for their outstanding herding abilities of any type of livestock. Today the Border Collie is a popular farm worker, family companion, and talented show dog. 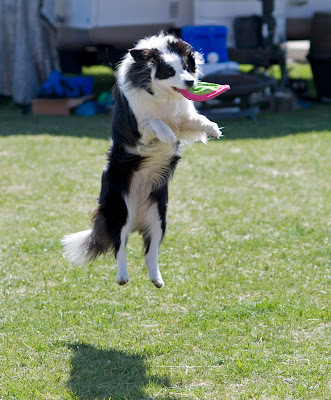 The Border Collie is medium-sized, exceptionally athletic, and possesses great endurance. This breeds obsession is their livestock work. They are high energy, confident, and determined. They are light on their feet, have a flowing movement, and are extremely versatile. This breed is intelligent, responsive, and devoted to their master and work. The Border Collie is extremely sensitive and thrives on human interaction. They are not recommended for the novice, sedentary or apathetic dog owner or for a home with a two-career family. They do not do well if left alone for extended periods of time and will suffer separation anxiety or become destructive. Border Collies do best in a home with older considerate children. They typically get along with dogs they have been raised with but should not be in a home with cats or other small household pets. This breeds inherent work ethic will lead them to attempt to herd anything and everything that moves. The Border Collie requires weekly brushing. Special attention should be given to the coat during shedding. Bathing or dry shampooing should only be done when necessary. This breed is prone to PRA, hip dysplasia, epilepsy, deafness, Collie Eye Anomaly, and allergies to fleas. The Border Collie comes in two coat varieties: rough or smooth. Both varieties are double coat and weather resistant and are close fitting and thick. The outer coat is either wavy or straight and coarse in texture. The under coat is dense, short, and soft. The rough coat variety has fur of medium length. The chest, forelegs, underside, and haunches are feathered. The coat on the face, front of legs, ears, and feet is smooth and short. The smooth variety has fur of short length over the entire body and there may be slight feathering on the chest, ruff, haunches, and forelegs. The color of the coat comes in all colors or combination of colors and markings. They may be solid, merle, sable, bi-color, or tri-color. Border Collies are average shedders. Early socialization and obedience are recommended. The Border Collie is easily trained and does best with praise, consistency, fairness, respect, and firmness. Due to their extremely sensitive nature this breed must never be treated in a harsh or heavy-handed manner. They are exceedingly talented in herding, police work, competitive obedience, search and rescue, Frisbee trials, and Flyball. 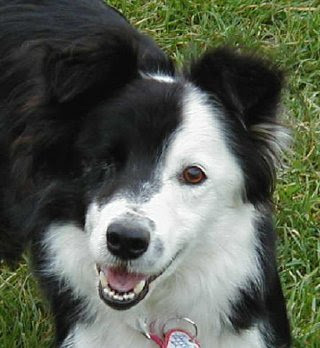 Border Collies are also used successfully as therapy dogs and guide dogs for the blind. The Border Collie has an inordinate amount of energy and requires more than physical exercise. They thrive on work, play, mental stimulation, and close contact with their owner and family. They are not recommended for apartment or city dwelling. They do best on a working farm or in a rural secluded setting where they are able to romp, run, and roam freely and safely. The Border Collie breed originated from landrace collies, an ubiquitous type found mainly along the British Isles. Many years ago, the first known origin of the Border Collie emerged from the border country shared between England and Scotland, hence the name. The original purpose was for them to work alongside sheep ranchers. In the year 1915, the term “Border Collie” was coined by James Reid, and served to distinguish the Border Collie breed from the Scotch Collie breed, as registered by the ISDS. Still, they are quite old as a breed, appearing in literature from as far back as the 16th century.